History of the Chamar Dynasty' over the past centuries bears witness to the fact that India was at no time a single political unit. Even during the reign of Chandragupta Maurya and Asoka, though a large part of the country was under the sovereignty of the Maurya Kings, and there were a considerable portion of the territory was under the control as an independent kingdom of the three subcontinent, i.e., India, Pakistan and China. The same story has been repeated by the Kushana, Guptas, and Moghul rulers of India. Today we have found that the integrity of the nation is threatened by the divisive forces of regionalism, linguism and communalism. In this way, the communal forces and the regional approach towards nation are gaining ascendancy in national life and seeking to tear apart and destroying the national integrity of India. It has a deep historical significance symbolising a fundamental unity to visualise the unity of their mother country on the basis of this historical work 'History of the Chamar Dynasty' written by Dr. Raj Kumar with the help of Devanagari script the 'Word' or 'Nam' which is nay, to transfigure mother earth into a living deity 'Baba Gurinder Singh Ji, Bias' and enshrined her in the loving heart of the worshipper. Thus, there has been a filial attachment between of Bharat or India and the people. The attachment of individual to his mother is the highest and she is the dearest. The deep emotional attachment of children of Bharatmata is strongly expressed in the following lines: "I am not enamoured of fame, knowledge luxuries of life, power, or heaven, or Moksha but my desire is to have rebirth in Bharat like the saint of Guru Nanak, Ravi Dass, Kabir, Maulana Rumi, Tulsi Dass, etc., as a human being or as an animal or as bird, or as, an insect or at least as a stone. 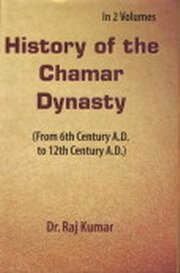 Title: History of the Chamar Dynasty : From Sixth Century A.D. to Twelfth Century A.D. Customer Reviews of History of the Chamar Dynasty : From Sixth Century A.D. to Twelfth Century A.D. I am working as a researcher in the institute of Integrated Himalayan Studies. I found this book very amazing and intresting. As it is related to chamar dynasty which are in huge no. in north India, it is very helpful to understand about the soul of this so called caste. I congratulate to the author for wrting such a knowlegable book. I am advicing the reader that if you really wants to know that who are the chamar then go through this book.